In the ongoing fight to secure for American single malt whiskey status as an official category recognized by the U.S. government, Stranahan’s distillery in Denver, Colorado, has fired a very delicious shot right across the government’s bow. 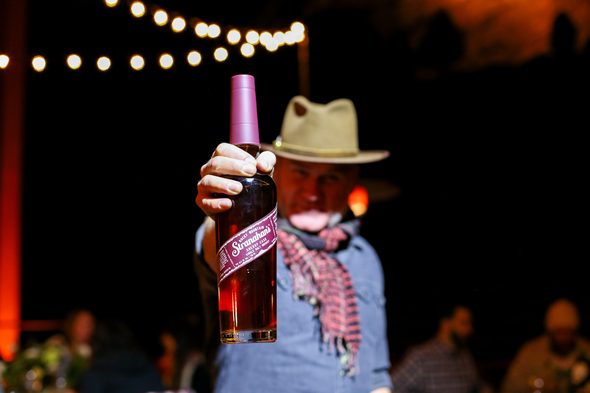 To celebrate the release this year of Stranahan’s new sherry-cask-finished American single malt whiskey, in October, Stranahan’s threw a dinner party on the stage at Red Rocks amphitheater. The event brought together journalists with industry people to dine at one of the most iconic music venues in America under the glow of yellow string lights and heat lamps against the chilly Rocky Mountain night. We went back stage at Red Rocks and snapped selfies in the green rooms. We sipped glasses of Stranahan’s original single malt, the four-year white oak-aged Diamond Peak line, and the new offering, a Stranahan’s four year-aged whiskey finished in a sherry cask, which lends it bright notes that bring the sleepier, softer Diamond Back back to life. With each we paired caramelized onion and parsnip soup, tomahawk ribeye marinated in garlic with truffle balsamic mushrooms, a gingerbread Belgian waffle, and more. The point of that rather overwrought paragraph is to say that Stranahan’s release party felt like something more than a normal spirits-industry launch event. The setting was gorgeous but also rarified, and not just in the altitude-related sense; it was (no one could quite agree) either the first time time anyone had held a banquet on stage at Red Rocks or the first time in a very long time. Perhaps it was because 2017 was the year American single-malt whiskey fought its way into the proverbial big leagues, or because the TTB at the U.S. Treasury presently considering a new official category with a Standard of Identity—which will allow American single malts to protect the category from imposters—for American single malt. But Stranahan’s event at Red Rocks felt like a kind of coming out party for the category. One hopes the high standards of Stranahan’s Red Rocks event, and the sophisticated craftsmanship behind its new sherry-finished single malt, flow downstream to the rest of the country, and especially Washington, D.C. As a category, American single malt has definitively arrived. It’s ready for official recognition that will allow the category to fully mature and flourish—and whiskey lovers all over the world will be all the better for that.